In cities such as Seattle, Los Angeles, New York and Portland, where congestion pricing is being discussed, local politicians instinctively question the new tolling policy as a tax on lower-income drivers. In fact, the majority of rush-hour commuters who drive into the central business district of major cities — especially in New York — are wealthier than their transit-bound neighbors. 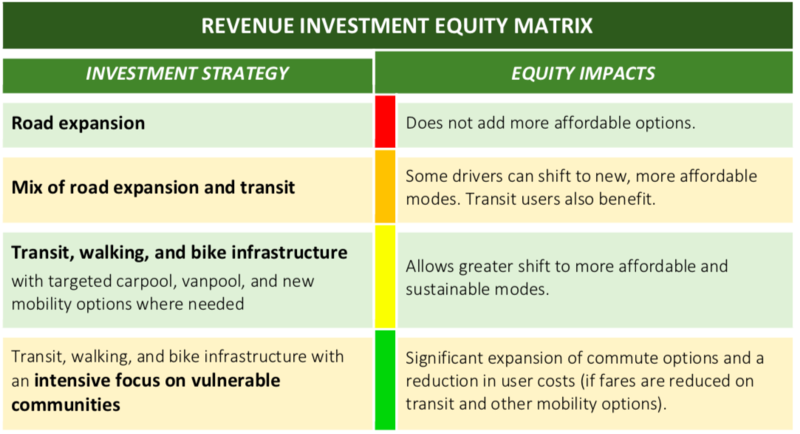 Transportation is inequitable in myriad ways both invisible and visible, thanks to the dominance of the automobile, the starving of public transit and the lack of affordable housing in our gentrifying city centers. That’s why it’s crucial to design a truly progressive congestion pricing program, says TransForm. High housing costs push the middle class and the poor away from job centers. If cities don’t have good transit, those workers will likely drive, which means congestion pricing would saddle them with higher transportation costs. But if the money is used for transit or alternative modes of transportation, the middle class will benefit at the expense of drivers, who tend to be wealthier. And using congestion pricing to fund transit is a win-win: it’s also better for the environment — and environmental equity has long eluded low-income groups and people of color. Many cities — Los Angeles, New York and Minneapolis included — already dedicate a portion of their highway toll revenue to transit. Congestion pricing can help advance transportation equity outcomes in and of itself. TransForm writes that when London set up its pricing ring, bus wait times dropped 30 percent and delays due to congestion were reduced by 60 percent. In addition to discounts or exemptions, or as an alternative, cities may want to consider offering discounted transit fares in response to congestion pricing. Many cities — Seattle, Denver, New York — already offer discounted transit fares to low-income people. And many other cities — Chicago, Boston, New York — also offer discounted bike share passes to low-income residents. Some cities are considering programs that would give discounts to low-income drivers or small business owners for their trips into the congestion pricing zone. London, for example, exempts people with disabilities and their drivers from the charges through its “Blue Badges” program. The city also discounts tolls for people who live within the congestion pricing area by 90 percent. And Seattle is considering income-based discounts on a tiered scale, so those making $25,000 or less would pay the lowest toll. Such income, disability or residency status discounts can help build political support for congestion pricing. But they “need to be carefully weighed against other program goals such as moving traffic more efficiently or reducing greenhouse gas emissions,” TransForm notes. Discounts can also undermine the central goal of congestion pricing: reducing car travel. Personal freedom means having choices. Many of the “75%” of commuters who drive would much rather walk, bike, or take a train, but they need infrastructure to make those choices feasible. Catering solely to car users has reduced freedom by restricting mode choice. Reducing congestion is also meant to improve air quality. Gas-powered motorcycles and scooters are often more polluting than full-size motor vehicles. That should be factored in when considering congestion-fee discounts. That is not a credible source. It’s not always a financially motivated conspiracy when a majority disagrees with you. Some random webpage that looks like it was designed twenty years ago is not a trustworthy source, especially when it contradicts a plethora of research into public attitudes toward congestion charges in London and elsewhere. I think you’re vastly under-estimating how rigid our institutions are. I agree that moving to something like a 6 foot highway lane for single occupant cars COULD be fairly transformative in terms of increasing capacity, but that being said, the world has had motorcycles for just as long as cars and 6 foot lanes exist nowhere. There’s places in this world with perfect motorcycle weather year round. Even in those places 6 foot lanes don’t exist. And the lane markings are certainly needed – and probably grade separation too. Just giving someone a smaller vehicle doesn’t change the rules of the road. Look at the behavior of bikers: Motorcyclists SOMETIMES share lanes when they riding on a pre-planned group ride (it would be much more efficient for them to take a car together in these instances but it’s mostly recreational) but for regular independent daily motorcycle use, motorcyclists seldom share lanes. It’s really hard to communicate while driving at 65 MPH, so everyone just follows the standard rules of road that treats the guy on the 250 cc bike the same as the gal hauling 90,000 lbs of timber. No havoc was created even though there are only twelve prototype vehicles of this type able to do this now. I think that the ruts in the road are clear since there are four tires have different tracking. Since it’s California and lane splitting in motorcycles is currently legal, it would suggest legalized narrow car lane splitting could be passed as well. Of course, other options could be instituted too, like segregated lanes, lane markings, etc. But given the cost of infrastructure changes, the barest needs would be to have the cars, lane splitting legalized, and narrow space parking legalized. The first to be given the option to lease the cars could be low income veterans. That would create excellent public relations, I think, and would be a great way to give back to the folks who served. @SingleIssueCommenter – Not all “government programs” are the same thing. There are real live actual substantive specific differences involved here, which are much more important than sloganeering about the gub’ment. Agreed. Happy to discuss. With my participation in Region 5 transportation decision-making, I’m very skeptical of transportation committees. Further, Boston Dig contractors Parsons Brinckerhoff and their ilk are still highly influential, Thus, my skepticism of general “congestion pricing” program. Sounds like a tax that will be impossible to quantify and will never end. Lane splitting like that would have a trivial impact on roadway capacity. 1. The other cars need to be slowed down so that limits the times of day when it’s actually useful. 2. How many vehicles could possibly be lane splitting at the same time? One or two, sure. But it certainly couldn’t reach more than 5-10% of vehicles on a highway. Where there’s obvious value for a skinnier car is making a 3 lane highway into 6 lanes, by re-striping each of the lanes to half their current width. We’d be totally awash with capacity, but it’s hard politics. Today, we can’t even get DOTs to re-stripe 42 foot ROWs from 3 lanes to 4. If we’re talking about alternative motorized vehicles: 1) legalize neighborhood speed vehicles (sub-35 mph) on most streets. Like a souped up golf carts. 2) make things safe for affordable 49 cc scooters and/or e-bikes. I don’t think it’s trivial. 1. If the other cars are moving fast, then the narrow cars would move fast without lane splitting. 2. If one could do it, many could do it. However, I attempted to find a youtube video for examples of continuous lane splitting and I couldn’t find one, so I’ll keep my eye out for it for sure. That said, I think wherever there’s a lane like the one in the video, I don’t see any reason why there couldn’t be continuous lane splitting. Isn’t the goal to reduce driving? Your point appears to be to ensure that low-income people have the same access to driving as high income people. Shall we have gas stations offer discounts on fuel to motorists based on their income level as well? It’s disturbing that this myth continues to float here among what I would consider science-minded people- I would understand if flat-earthers and climate deniers said this. If you consider Euro 4 and above regulations and match that with cars Euro4 and above, they are not any more polluting. Plus they spend less time on road and esp if lane-splitting gets legalized, even lesser time- which equals lesser emissions per mile. This has been proven by the fact that every single European country exempts Euro 3 and above motorcycles even in their most stringent ultra low emissions zones. And yet, Americans somehow don’t get it because of what seems to be some sort of prejudice. Yup, totally agree. But do you think this city will give us money to buy anything? Even something like what Oslo does- $1200 to everyone in the city to buy ebikes? Until that day comes, just incentivizing motorcycles is the easiest and zero-cost way to reduce congestion, even pollution and solve the alternative transport problem. Powered two wheelers are part of the solution. Simple- because of unscientific prejudice among lawmakers, NYPD and even transit advocates here. If only they had the common sense, logic and social sensitivity of the Europeans that they want to emulate so much, esp the advocates. How about 90-100 liters of stuff in cases plus a passenger of 150-200 lbs? Minimum. Exactly. But tell that to the folks who think cycling is the solution for everyone. This a socio-economic issue as well I have come to realize. My goal is to alert people that improved auto design is a better way to resolve traffic congestion than taxing. My point is that if highway driving is legal, and if driving alone on a highway is legal, it’s best to create policy to transition as many people away from side-seated gas-powered cars to thin electric cars. The discount question is a good one. To me, it’s a little like asking whether poor people should have discounted cigarettes and booze. However, currently – emphasizing “currently” – gas is very important in transporting poor folks, so it would, indeed, be better for poor folks to have discounted gas like programs where poor folks get discounted transit passes. For the future, however, I think that gas stations are terrible for the pollution they create, so the sooner they’re fazed out the better. Far, far better to offer narrow electric car leasing at 1/2 price to poor folks to avoid gas stations and traffic congestion entirely. Could you tell me where the study “Comparison of Real-World Emissions from Two-Wheelers and Passenger Cars,” by Basic and Weilenmann, got it wrong? I’ve seen many similar studies coming to similar conclusions. I know many states exempt older motorcycles from the strictest emissions regulations. Evaluations by the Air Resources Board of California and others have found that motorized two-wheelers contribute disproportionately to emissions, and I haven’t seen much opposition to that idea in academic circles. Ok, I will bite- since it’s not clear to you somehow.That report is old from 2006 and yet, is studying even older (1999 and older) motorcycles. We are in 2019. Show me newer studies. Also, I mentioned Europe, not US- Euro emissions are more valid as the motorcycle industry (Except Harley till recently) builds their engines for that market. The US EPA has to really up its standards. Anyway, maybe look at the Leuven study from 2011 that showed reduction in congestion and pollution by switching 10-20% of cars to motorcycles. Or even Gridlock Sam’s study from 2007 based in NYC which concluded about the same thing. And those are still old studies. Euro 4 and above motorcycles are way cleaner. And to reiterate, they spend less time on the road- literally half of my commute time on the subway- and end up emitting much less. Fully-electric is the dream but one that NYC will take years to achieve. Motorcycles cut commute-time now, in the present, even with the mess of congestion. And a modal shift from cars to motorcycles would also cut congestion- also proven in nearly every single European city with any sort of congestion pricing. In fact, Euro 3 (and above) motorcycles are exempt in most, if not all, ultra low emissions zones in European cities. They obviously know what they are doing- makes sense as they are definitely more aware of socio-economic equity. Please stop embarrassing the real environmentalists like me who spend their lives trying to convert climate-change-deniers who refuse to listen because people like you prefer to present outdated, irrelevant data and emphasize prejudice-laced hyperbole instead. Motorcycles are, and have always been, one of the most accessible solutions for inequitable transportation- irrespective of existing prejudice against them, which itself is born out of socio-economic inequity. It sounds like older motorcycles are are still extremely polluting, but newer ones held to newer standards are less so. So, like I said, we should keep that in mind when setting policy. I don’t think the equity argument should be taken as good faith necessarily. Consider that while some may have honest concerns about equity, others may be against the proposal for other reasons and using the equity argument primarily as a tactic. Figure out which stakeholders are against the plan and instead of reacting to their agent’s demands directly, provide a counter-offer that would be attractive to that agent’s base of support. Consensus is not a reasonable political goal. Yes, thanks. I am not here to baby any sort of ignorance. Most motorcycles sold in the US already adhere to Euro norms so they are already way better- they clear EPA norms without skipping a heartbeat. However, because motorcycles spend less time on the street as compared to cars, even Euro 3 motorcycles emit less than cars and will lead to reduction in pollution. Hence, as I have said before, smart European planners allow Euro 3 motorcycles in ultra low emission zones- and so should we. That is the right socially equitable thing to do. That is what we should keep in mind when setting policy. It sounds like you have a rigid emotional connection to your beliefs on this issue, so I’m going to bow out of this conversation. And you have a loose relationship with the truth and scientific reasoning just to forward a narrow, socially-inequitable agenda. You really need someone who is not a zealot to write your scripts for you. You sound comical, and I don’t think that’s what you’re going for. Don’t worry about me- just do society a favor and stop spreading falsehoods and half-truths esp if you are concerned even remotely about environment and social issues. In the experience of environmentalists and social workers like myself, people like you are the biggest impediment to making non-believers into believers.